A FORMER US Airbase commander at the centre of the UK’s most controversial mass UFO sighting insists “we are not alone,” but world leaders are “covering up” the truth. 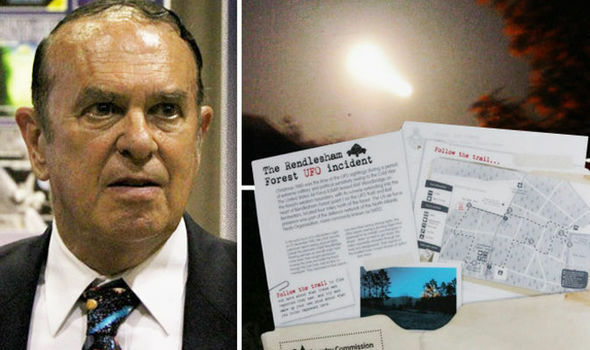 Retired Colonel Charles Halt, the most senior former US servicemen to go public about alien sightings, also said he has obtained “new evidence supporting” claims that a UFO LANDED in Rendlesham, Suffolk, next to an RAF base in 1980. The Rendlesham legend has been dubbed Britain’s Roswell after the mystery UFO crash said to have happened outside the town in New Mexico, USA, in July 1947. The UK alien sighting happened when three US officers based at RAF Bentwaters claimed a “triangular shaped craft” landed in neighbouring woods in the early hours of December 26 1980. Mr Halt, 75, who was base deputy commander at the time, was not present during the first encounter, but was told next morning. He claimed the officers who first saw the lights and then a UFO “on the floor” could not account for a 40 minute period while searching in the woods when their communication systems went “off air”. The three – John Burroughs, Bud Steffens, and James Penniston, later told of feeling “static” as they observed the object’s flashing lights and hieroglyphic-like markings. He went to investigate with a team who found three 1.5inch “impact holes,” damage to the canopies of trees and “higher radiation levels” in the “landing” area. A plaster cast was later taken of one of the holes, but mysteriously disappeared from a box it was stored in. “It came towards us into the forest, moving, bobbing up and down in the trees. It was oval, about 100 to 150 yards away, with a dark centre and red around it,” he said. They then spotted objects in the sky, 3,000 to 4,000ft up. One was “elliptical, but became a “full circle”. Mr Halt, who flew from Virginia to attend UFO conference in Suffolk, said they continued to observe for an hour before returning to base at 3am, where he recorded an account on a tape. He wrote a memo for the MoD, so they could investigate but they never responded. Subsequent requests for MoD documents from the time came back with papers missing “from that exact time frame,” he said. He claimed Mr Burroughs and the two others have been unable to obtain medical records because of secrecy surrounding what happened. Mr Burroughs this year won a court battle forcing the US Veterans Association to pay his legal bill for heart failure treatment amid claims he suffered radiation poisoning during the UFO search. While still on scene, Mr Halt had radar checks done at Bentwaters, nearby RAF Wattisham, and even the “Healthrow Tower”, but they all came back negative. Subsequent checks by the MoD, in response to researcher’s inquiries years later, also found no radar observations. However, Mr Halt told the conference he now had statements from former operatives at RAF Bentwaters and RAF Wattisham, saying an unidentified object darted across their screens at the time. He said: “I have confirmation that (RAF Bentwaters) radar operators saw the object go across their 60 mile scope in two or three seconds, that’s thousands of miles an hour. “It came back across, stopped near the water tower, they watched it and observed it go into the forest. Mr Halt, who became an airbase commander at Kunsan in South Korea, claimed the former service people were too scared to speak out until after retirement. Alternative theories claim the light came from either the Orfordness lighthouse, military tests, a helicopter carrying a dummy Apollo capsule, or was even a UFO prank by airmen that spiralled out of control. Sceptics have pointed to inconsistencies in various witnesses’ accounts and more detail being added over time. Mr Halt did little to dampen this, after refuting the accounts of several of his former colleagues made in various books. The Suffolk UFO conference was organised by ex-cop UFO researcher John Hanson, who said Mr Halt was “a reliable witness” and backed the “cover up” claims. He added the new radar evidence “undermined” Government suggestions the mass sightings were down to the lighthouse. Members of the public also claimed to see lights heading towards the forest around the same time. But, two police officers also investigated the reports at 4:11am on Boxing Day morning 1980, but reported no trace of anything.